A recent visitor asked for some tips for making a paper mache horse for her daughter. I’ve never made one, but I think my grandson would love one for his room, too. I love the long legs on a new colt, even though they’re going to cause some problems with this project. And the spots on an appaloosa are so adorable! The beginning of any project is always a bit scary, because there’s a lot of engineering involved – and I didn’t pay much attention in my math and science classes. In the photo above you can see that I made a sketch of a colt, using as inspiration an art book that I’ve had for years and some photos I found on the Internet. In the sketch you can clearly see the shoulder and hip bones, and how they affect the shape of the body. 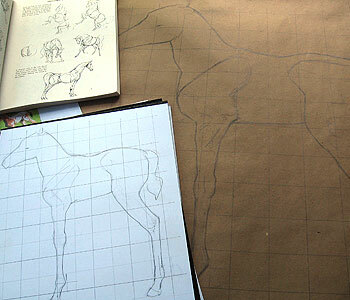 (For more info on this issue, see my recent post on basic anatomy for paper mache animal sculptures). 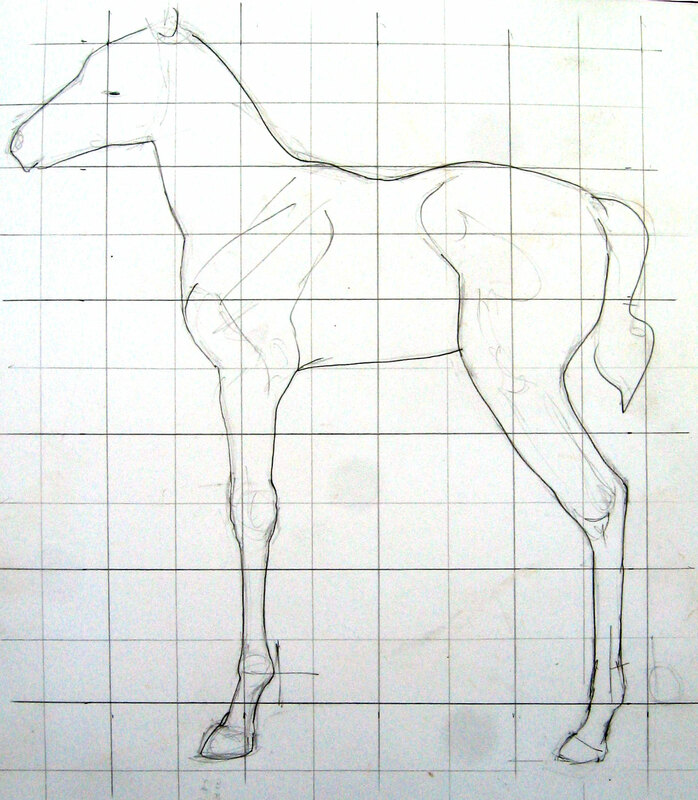 If you’d like to use the pattern I made (it’s a bit rough, but it works) you can download the image of the horse pattern here. Whenever you do a three-dimensional sculpture based on two-dimensional photos, you need to find as many photos as you can so you can see the animal from all sides. I don’t normally make a full sized drawing ofÂ my sculptures. In fact, a lot of times I don’t make any sketches at all. However, the legs on this colt are going to give me difficulties so I decided to make a drawing the exact size of the finished piece. I’ll be using the full-sized drawing as a pattern for the legs. To make the original drawing larger, I drew a grid on my original sketch with one-inch squares, and then drew a grid with two-inch squares on a large piece of brown paper. Using the grids, I reproduced my original drawing twice as high and wide as the original. The second sketch is about 23 inches high. I thought this would be a fairly respectable sized paper mache horse for a little boy’s bedroom. I know I can’t make the legs hollow and pour plaster in the bottom of the legs to keep the colt from falling over, like I did with the giraffe, because the legs are too thin. That means the sculpture will be top-heavy and it will fall over at the slightest nudge unless I find a way to make the legs heavier than the body and the head. It would be even better to just make the bottom half of the legs heavy, but I couldn’t figure out a way to do that. Since the legs are thin, they need to be made quite strong in order to hold up the sculpture. However, many options I considered for strengthening the legs got rejected because the finished piece may be in a toddler’s bedroom, and safety is my primary concern. If I used wire as an armature in the legs and my grandson fell against the sculpture or jumped on it, the wire could break through the paper mache and poke him. Not good. The same thing could happen if I cut wood pieces to go inside the legs – if my grandson fell against the colt the wood inside the legs might break, making them sharp and potentially lethal. The solution I came up with is not the best, but I think it will work. I’ll be making the legs out of plaster board (wall board) inside the paper mache. Plaster board is a little bit heavier than cardboard (another option), but it’s not very strong and has no real structural strength, especially when it’s cut so thin. However, I think the paper mache layers on top will make it strong enough to hold up the colt. And if my grandson does break one of the colt’s legs there won’t be anything inside that could cause him an injury. The plaster board will just bend or crumble. 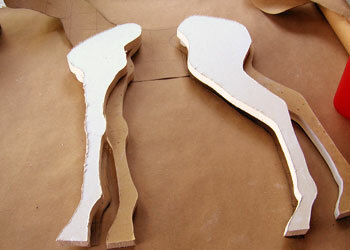 I used my full-sized drawing as a pattern for the legs, which I cut out of a scrap of plaster board with a jig saw. Now my problem is to round off the corners without breaking the legs, since all the strength in this material is in the paper that holds it together.Â Tomorrow you should be able to see if I succeeded, or if I have a pile of plaster on my work bench… Wish me luck. Gorgeous! I’m creating an Enchanted Forest area for my granddaughters Sweet Sixteen Birthday and have been searching for a realistic paper mache horse so I can make a life size unicorn. This is by far the absolute best I’ve seen. You’re amazing. Thank you for sharing the horse pattern! Now on to the trees and tree canopy. I’m glad you like it, Toni. If you make one of these horses, be sure to use cardboard for your pattern instead of the plasterboard that I experimented with. I hope your granddaughters have a wonderful birthday. Thank you Jonni! I read your comment about the instructions in your book being much easier. I believe I will order the book. I will definitely use cardboard. Thanks again. Good catch, Sandy. I just now added the links to the bottom of the article. You can also find all our extended tutorials, with links to all pages, here. I make a paper mache horse head and I am very surprised, that look so alive! I love the way you included the underlying bone structure, including the shoulder and hip, on the legs. It gives the colt a realistic “coltish” look already. You got the look of a colt stance just right from the rear view. I look forward eagerly to watching the colt come to life. Remember, the babys have totally different manes and tails than mature horses. Baby manes and tails might work just fine in paper. Also, horses are prey animals, so their eyes go on the side of their heads. So many people put the eyes in a predator position in front, like ours. He’s going to be so adorable! Hi my name is Philippa, I’m looking for a bit of help I’m trying to make a life size horse for a school in Morecambe in the UK. But don’t know where to start. wondering if you could help me? For a life-sized horse you’ll need a good armature. You could make it from metal, wood, or foam. You might get some good ideas if you watch my video about making a baby elephant – it isn’t as big, but it might help to watch it. Hi Jonni, i am making a paper mache horse for a school project and am using cardboard armature. Would it be possible to use paper mache clay for the legs and the rest of the body? Thank you for your website which i have found so useful. Hi Sarah. Yes, you can use the paper mache clay on your horse instead of paper strips and paste. That’s how I made the horse in my book, in fact. 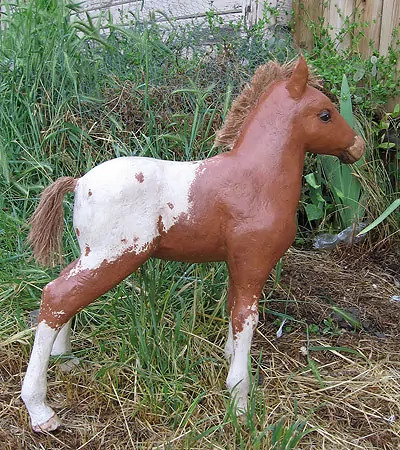 You can see a video I made about the paper mache clay horse when the book first came out. Hi Jonni, I really liked the tutorial on the horse. What a great idea using burlap for the tail and mane. I can’t wait to try it. Thanks so much for sharing with the rest of us out here in cyber space. I’m probably gonna try a flying unicorn, and am quite concerned about having to hang it to the ceiling. I’ll figure something out. I’m really amazed at your work, the elephant is absolutely stunning. For the very best instructions I’ve ever seen about creating large, hanging sculptures, check out Monique Robert’s book. I wrote a review, here. I sure hope you’ll let us see that unicorn when it’s done. What a challenging project! Nice videos, Jane. Thanks for sharing. It’s amazing i love making things and just found your website and think i may start a project i am MAD about ponies so i thought i may do a smaller version of your pony if i can!! your work is amazing!!!! I have only just taken intrest in papier mache. I see that you have quite a bit of progress already, and I can’t tell you how thankful I am that you were willing to do this project. I just hope that my daughter and I are able to make one too. I wish you the most luck at success on this project. You really are a great and kind person. Thank You very much. I wish you luck though I am sure you will proceed. I’m so glad I found your site, Jonni.